A comprehensive overview of the major regional and global trends in trade and trade finance, covering issues related to the trade finance gap, access to finance, export finance and supply chain finance – and how digitisation, new technologies blockchain and FinTech are reshaping the industry. 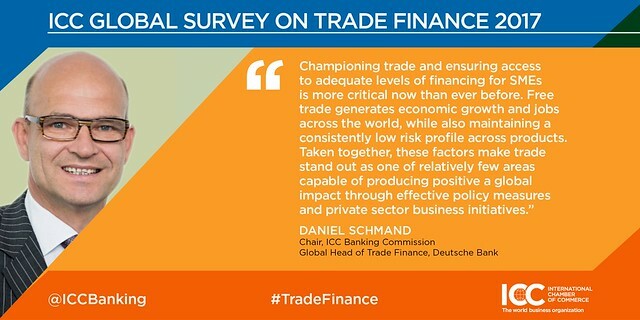 With 255 responses from banks located in 98 countries, as well as various contributions from leading experts in the field, “Rethinking Trade & Finance” is the most extensive gauge of the trends and outlook of the global trade finance industry. It aims to provide insight and analysis to help readers formulate strategy and make decisions that will advance the evolution of global trade. The 2017 edition comes at a transformational moment in the history of trade and the global economic system. The report has its roots at the peak of the global financial crisis, and has since earned its place as a leading publication on the subject of trade, finance and economic inclusiveness. The Report encompasses four major sections of content linked to the pillars of the Banking Commission’s strategy. It focuses on the state of the trade finance market; trade and supply chain finance; policy, advocacy and inclusiveness around global trade; and digitisation and the state of FinTech. To view and share key facts and findings from the 2017 global survey, check out our Flickr album below. A detailed statistical analysis of the regional and global trends in trade and trade finance, followed by a digest of the latest trends in the support of trade operations by export finance, export insurance, forfaiting, factoring, as well as multilateral development banks, and views on the growing relevance of digitisation developments and the importance of financing trade sustainably. A detailed statistical analysis of the regional and global trends in trade finance followed by a digest of the activities of multilateral development banks and export credit agencies in trade finance that charts their growing presence.